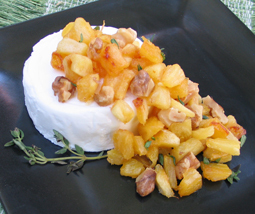 Roasted Pineapple with Ms. Natural Goat Cheese - A recipe from Savor California, the online showcase for extraordinary gourmet foods and beverages from California. Toss pineapple and butter on a small baking sheet. Roast for 30 to 35 minutes or until lightly browned, stirring occasionally. Spoon over goat cheese and sprinkle with walnuts and fresh thyme leaves. Serve with crisped baguette slices.